Educators from across the region gather in Pioneer Courthouse Square to denounce proposed Oregon K-12 education budget. 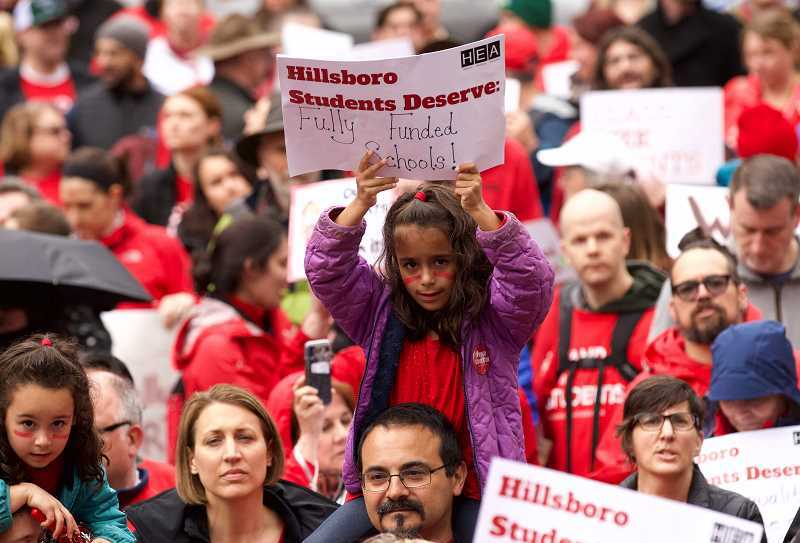 Hundreds of Portland-area teachers filled Pioneer Courthouse Square Wednesday afternoon to rally for better public school funding from Oregon lawmakers. The April 10 "Take it to the MAX" rally included teachers and school employees from several school districts who rode MAX trains and gathered downtown for increased education funding by state legislators. Teachers gathered, chanted and waved signs and banners. "When music teachers are under attack, what do we do?" Lindsay Ray, a Beaverton School District teacher, shouted through a megaphone. "Stand up. Fight back!" the crowd responded. 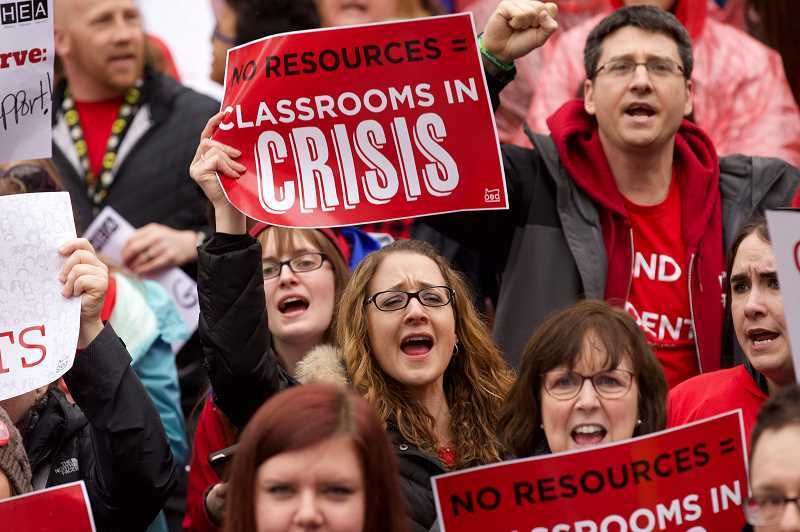 "Our schools are at a crisis level," Suzanne Cohen, president of the Portland Association of Teachers, said Wednesday, a few hours before she and her colleagues descended Pioneer Courthouse Square's steps. "We're trying to signal that it's time for our Legislature to fix it, because the education budget being floated right now is a cuts budget." Employees like Joseph Vermeire, a general education specialist at Miller Education High School in Hillsboro, said they fear for their jobs next year. "This is the first time ever in my 13 years of teaching here that the principal has come to us and said we're going to be cutting a (full-time) position next year," Vermeire said. Wednesday's event was one of several organized this year by Oregon Education Association member unions. In March, teachers rallied with banners and signs on freeway overpasses advocating for better state funding. Next month, a walkout is planned. 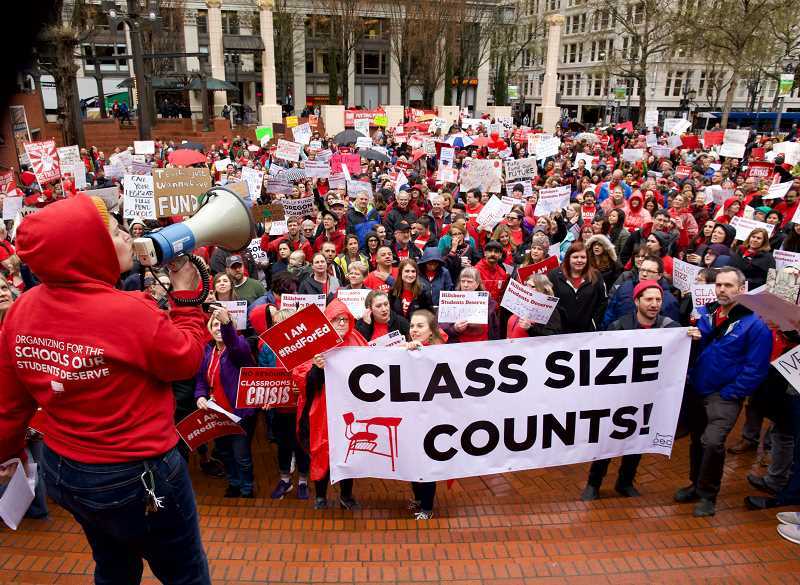 "We have about 40 percent of our membership here today," Kevin Zerzan, president of the Gladstone Teachers Association, noted as he stepped off a MAX train. Zerzan, who also teaches science classes at Gladstone High School, was one of hundreds of educators who wore red to the rally. Zerzan said he and his fellow teachers are "tired of underfunded classrooms and students." "The hope is to basically express the seriousness of the opportunity we have," said Nolan Bryant, a history teacher at Sunset High School in Beaverton. "We have a pro-education governor and [legislators] who campaign on a promise to support schools. This is a serious chance to overturn 30 years of chronic underfunding."